Dimensions 14.17" x 5.51" x 1.63"
I got this keyboard during winter break and I am in love with it!!! 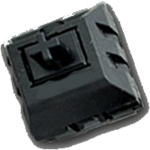 At first I was skeptical because this keyboard has PBT switches but I can tell you that it is pretty much the same as cherry switches. 10/10 would recommend. I've had this keyboard since November and have had no problems with it! 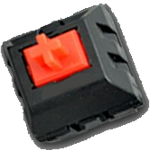 The KBT Browns are great for gaming (I play csgo), I've no complaints and have never had a problem with the switches not activating. 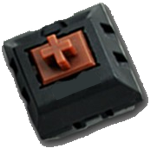 The PBT keycaps are nice, textured and are less likely to get that greasy shine over time that ABS keycaps often do. Some may find the lighting modes limited as you can't customize certain keys to glow certain colors, but as long as I can see what I'm typing in the dark, I'm not fussy about it. Solid build. I also type with it occasionally and don't find that I need a wrist rest, but this will depend on your setup of course. The keycaps are easily removed and replaceable if you want to customize the color schemes, if you're into that. Overall, would recommend if you're looking for your first mechanical TKL. The keyboard's main feature is the RGB. Unfortunately, many of the lights do not shine all the way through the keys and get clipped in certain parts. These inconsistencies are very noticeable when using the RGB feature. For this price, look for a better keyboard elsewhere. I'm from Canada and I bought this and I love it! It cost me with shipping and customs fee and usd to CAD conversions over 230 dollars. I also upgraded the keycaps to double shot PBT and I'm so happy. Sure its alot to spend on a board but its worth it. I love the KBTALKING switches there is no SWITCH PING!!! That my Romer G's G810 had, which drove me absolutely insane. I saw reviews of this board on youtube talking about the no ping and I was like I have to get this and pray for the best. Even right now im typing at night in my room in silence and there is no annoying ping. Its just pure browns and its sweet. Thank you mk for this! 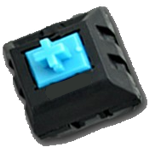 I will want a blue switch one in the future and I will know where to go. Get this board. and I recommend a wrist rest tho. Thats the one negative. It doesn't come with one.